Marc Becker, Paula Cochran and Teri Heckert are not pictured. 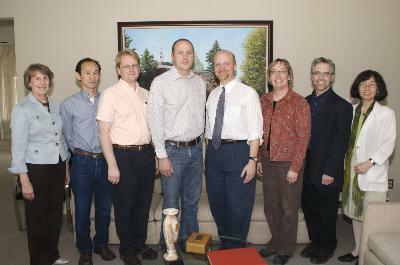 Seventeen faculty members have been awarded a Research Fellowship for Summer 2008. The purpose of the Summer Research Fellowship is to encourage and support research, scholarship, performance, and other creative endeavors of the faculty that will ultimately result in the public dissemination of the peer reviewed work. 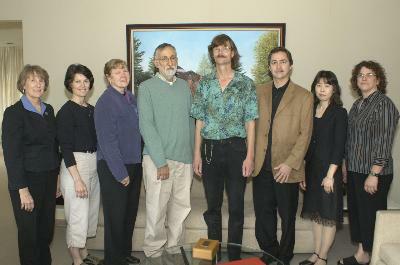 The faculty members selected for this honor are: Matthew Beaky, associate professor of physics; Marc Becker, associate professor of history; Joe Benevento, professor of English; Tom Capuano, professor of foreign languages (Spanish); Paula Cochran, professor of communication disorders; Masahiro Hara, associate professor of Japanese; Teri Heckert, professor of psychology; Wolfgang Hoeschele, associate professor of geography; Jennifer Hurst, assistant professor of exercise science; Greg Jones, professor of music; Huping Ling, professor of history; Barbara Price, associate professor of English education; Peter Ramberg, associate professor of history of science (chemistry); Tom Stewart, assistant professor of linguistics; Wynne Wilbur, associate professor of art; Yukari Yano, assistant professor of music; and Janice Young, assistant professor of health science. A total of 13 $4,000 fellowships and four $2,000 fellowships were awarded.